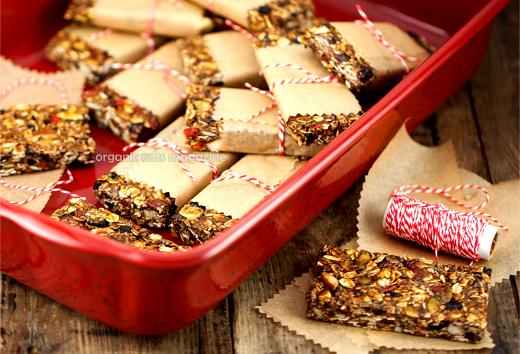 Super Power Bars are loaded with super foods to keep you going when you need a pick me up. They also make a great “to go” breakfast or post workout snack. Gluten-free Super Power Bars make a super meal replacement. And are a healthier option than commercial protein bars. DIRECTIONS—add oil, molasses, and syrup to saucepan. Warm over medium-high heat, stirring occasionally. Bring to a boil, reduce heat, and simmer while you mix other ingredients. In the meantime, chop nuts of your choice and add to a large bowl along with the oats, cacao nibs, goji berries, blueberries, pumpkin seeds, cinnamon, nutmeg, and salt. Mix ingredients well. Add nut butter to saucepan and mix until incorporated into the syrup mixture. Remove from heat and mix into dry ingredients in bowl. Mixture will be sticky, once it cools you may want to mix everything together with your hands. Line a 13 x 9 inch pan with all natural waxed paper. Add power bar mixture into pan, on top of waxed paper. Press down into an even layer. Cover with another piece of wax paper and continue pressing mixture into pan until even across the top. You can use a flat bottomed glass to press the mix into the pan. Refrigerate just until firm. If you refrigerate too long, bars will be too hard to cut. Cut bars evenly, you can use a ruler. 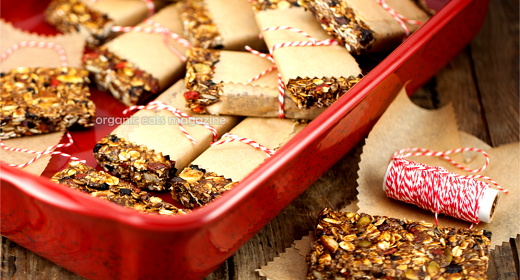 Wrap each bar in a piece of parchment paper and secure with twine. Store bars in refrigerator. Bring to room temperature before eating.